The most fly hat style, Bucket Hat, has now been combined with the most insanely good clip art that can fit into text message or Instagram captions: Emoji. But we’re not at 100% yet. 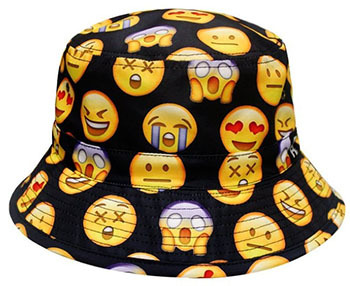 No, for that you’d need the “100 Emoji” bucket hat, featuring the emoji of the number “100″, which is weird to Emoji, because you can already type it on a keyboard. But that’s because the free market self-optimizes for profit, not efficiency of communication.